This image depicts three hot blobs of matter orbiting a black hole. If placed in our Solar System, this black hole would appear like a dark abyss spread out nearly as wide as Mercury's orbit. And the three blobs (each as large as the Sun) would be as far out as Jupiter. They orbit the black hole in a lightning-quick 20,000 miles per second, over a tenth of the speed of light. Giant black holes are famous for their appetites, but these matter-munching monsters are even greedier than scientists once thought, a new study suggests. The supermassive black holes that lurk at the center of most (if not all) galaxies are growing surprisingly quickly, the study found. The result implies that these cosmic behemoths are sustained primarily by frequent small meals rather than rare and dramatic galactic mergers, as was previously believed. Supermassive black holes are almost incomprehensibly huge, with some containing 10 billion or more times the mass of our own sun. The research team used computer simulations to investigate how such black holes grow, especially in spiral galaxies like the Earth's Milky Way. The astronomers found that, contrary to prevailing theory, central black holes can grow quite rapidly in quiet, merger-free spirals simply by sucking up galactic gas and other matter. 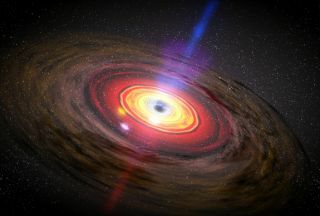 "These simulations show that it is no longer possible to argue that black holes in spiral galaxies do not grow efficiently," study lead author Victor Debattista, of the University of Central Lancashire in England, said in a statement. "Our simulations will allow us to refine our understanding of how black holes grew in different types of galaxies." And such growth can be prodigious. The black hole at the heart of the famous Sombrero Galaxy, also known as M104 or NGC 4594, has swallowed the equivalent of one sun every 20 years and now contains at least 500 million solar masses, researchers said. The supermassive black hole at the core of the Milky Way Galaxy appears far less greedy, growing at a rate of one solar mass every 3,000 years, researchers said. Scientists estimate that this black hole, also known as Sagittarius A* (pronounced "Sagittarius A-star"), has the mass of about 4 million suns. The new study was published today (Feb. 12) by The Astrophysical Journal.